The Indian Jewelry Capital of the World. Small size sterling silver squash blossom necklace strung on seamed beads with free form natural Sleeping beauty turquoise. Size: The necklace measures 21 inches in length when open. The naja measures 1 3/4 by 1 3/4 inches. The earrings measure 1 1/2 inches tall including the hook for pierced ears. 1.7 ounces total for the set. We are a family owned business founded in 2007. Gives us some tremendous marketing advantage because our town is indisputably billed as the Indian Jewelry Capital of the World. Most of our retail pricing is done by a simple formula based on our wholesale acquisition cost. Vintage and irreplaceable items are priced by our own appraisal. All items are priced to sell as marked - we do not discount. Approximately 95% of what we sell is bought on the reservation or in. We screen diligently to avoid imports masquerading as authentic Native American jewelry. Our stock merchandise comes from well established, reputable wholesalers and individual artists. We will provide a certificate of authenticity on request, but keep in mind that they are rarely requested for they have little if any value because they are the easiest thing to fake. Rarely is it practical or financially worthwhile for a single piece. In reality most of the artists are elusive and not inclined to do custom work. Return of items for credit must be within 14 days unless an exception is granted. 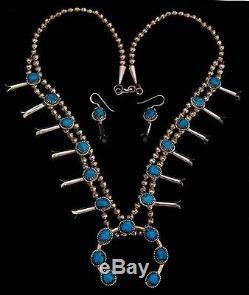 The item "Native American Navajo Mini Squash Blossom Necklace with Earrings" is in sale since Monday, October 10, 2011. This item is in the category "Jewelry & Watches\Ethnic, Regional & Tribal\Native American\Necklaces & Pendants". The seller is "directfromgallup" and is located in Gallup, New Mexico. This item can be shipped worldwide.